Another day, another woman shamed for being pregnant. But news anchor Laura Warren responded to the hate in truly amazing form. When it comes to pregnancy style, only one rule applies: Pregnant women should whatever the heck they want. Contrary to outdated notions, there is absolutely no reason for a woman to hide her belly away just because it's growing. Unfortunately, this story proves not everyone understands that concept. 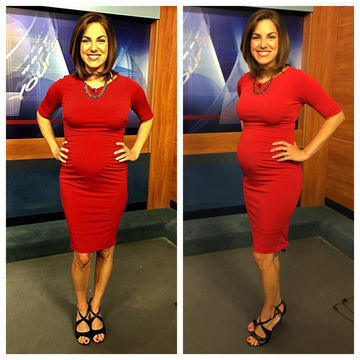 Pregnant news anchor Laura Warren did something many pregnant women everywhere "dare" to do: She wore a gorgeous, fitted, bump-hugging dress. No big deal, right? Except one viewer wasn't in favor of her outfit choice (because what a woman wears is everyone else's business, right? *eyeroll*) and decided to voice this opinion. According to a blog post from Warren, the viewer left her a nasty voicemail, saying: "Please go to Target and buy some decent maternity clothes so you don't walk around looking like you got a watermelon strapped under your too tight outfits. Target's got a great line of maternity clothes in case you've never heard of such a thing. You're getting to where you're being disgusting on the TV." "So, the thick skinned journalist in me who knows better than to give comments like this a second thought says, delete the voicemail and move on," Warren wrote on her blog, Bump, Baby and Breaking News. "Unfortunately, I'm pregnant, hormonal, currently not allowed to drink wine, and feeling extra in touch with my feminist side...This lady doesn't deserve to get a rise out of me. Does she know that I'm wearing maternity clothes? What does she want me to wear, a moo moo from the 50's? Does she know this is 2017? WHY DID SHE CALL ME?! And, why can I not stop thinking about this?! Hmm...bless her heart..."
Fit Pregnancy caught up with Warren to learn more about how she felt after hearing the voicemail. "SO many thoughts," she said. "At first, [I felt] a little bit of shock. I was just really caught off guard to hear such contempt in her voice. And, then, when it sank in, I kind of went back and forth between having my feelings hurt and outrage." But her story has gone viral, and with that, Warren discovered something positive: The fact that countless people have rallied behind her. "I really had no idea how much support I would receive when I posted this. But, I think the reason I've received such kind feedback is because it struck a nerve with so many women who have felt these same insecurities," she said. "And not just women. Husbands, fathers, friends of women who have been pregnant and received some sort of criticism about their looks. The majority of people have said, 'Don't give that woman a second thought, and keep on being you!' And, they're right! But part of the reason I wrote that blog is to get a discussion going about how easy it is for us all to hang on and dwell on that ONE negative comment, instead of a whole sea of positive ones. It defies logic, but it's human nature. I wanted this to be a reminder that your words have such power. Use them for good."